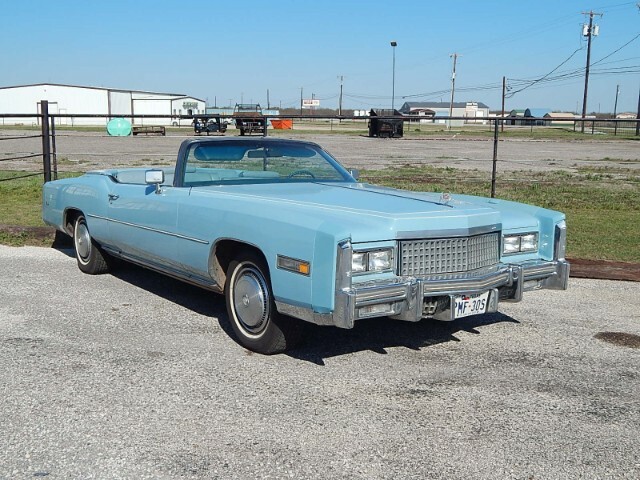 1975 Cadillac Fleetwood Eldorado Convertible Powered by the 8.2 Litres, V-8 (500 CID) Turbo Hydra-Matic Transmission. Only a little over 8900 units were built in 1974. Here we have a very nice cruiser in Jennifer Blue and light blue leather interior. Power top, Automatic Climate Control with Economy Setting. Looking for that cool car here it is. Call for more info. Message: Thought you might be interested in this 1975 Cadillac Eldorado.